It is time to contribute to open source. Contest is closed. Congratulations to the winners (see below) and special thanks to the sponsors. 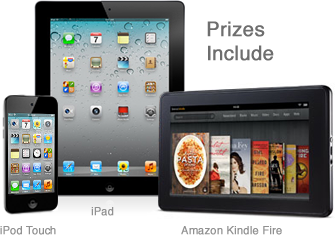 In celebration of the 300th RailsCasts episode I am hosting a contest with awesome prizes including an iPad, iPod Touch, Kindle Fire, and more! All you need to do to enter is submit a GitHub pull request to your favorite GitHub Project. The winners will be chosen at random from all qualified entries shortly after the contest ends on December 31st. To qualify, the pull request must address a legitimate issue and be of good quality. It cannot be a duplicate of a previous pull request. The pull request does not need to be accepted by the project owner, but I will look at the feedback. If I am not happy with it, I reserve the right to toss it and draw another. Do you want to increase your chances of winning? Submit multiple pull requests! A maximum of 5 are allowed.